This flammable gas and smoke sensor detects the concentrations of combustible gas in the air and outputs its reading as an analog voltage. The sensor can measure concentrations of flammable gas of 300 to 10,000 ppm. 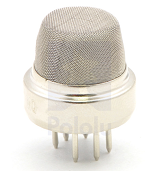 The sensor can operate at temperatures from -20 to 50°C and consumes less than 150 mA at 5 V.
Connecting five volts across the heating (H) pins keeps the sensor hot enough to function correctly. Connecting five volts at either the A or B pins causes the sensor to emit an analog voltage on the other pins. A resistive load between the output pins and ground sets the sensitivity of the detector. Please note that the picture in the datasheet for the top configuration is wrong. Both configurations have the same pinout consistent with the bottom configuration. The resistive load should be calibrated for your particular application using the equations in the datasheet, but a good starting value for the resistor is 20 kΩ.